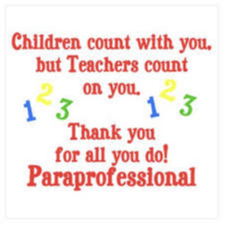 Wednesday, April 3, 2019, is Paraprofessional Appreciation Day where we honor our paraprofessional educators (teacher's aides). This is an excellent time to show appreciation for them, whether it be with a gift, a note, or a word of thanks. Thank you ladies for all you do for our school!